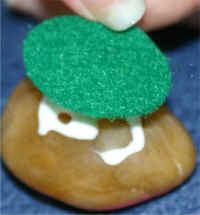 This craft is a variation of the pet rock that would work well for a David and Goliath Sunday School lesson plan. You can keep it simple and just paint the rocks or you can add glitter glue or hot glue on things like sequins or crystals. If you're going to play the game, just use paint -- glued on items will fall off after a round or two *grin*. 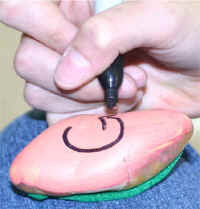 If you're going to play the game, glue a small piece of felt to the bottom of the rock. If you're going to play the game, put a G (for Goliath) on the largest rock. 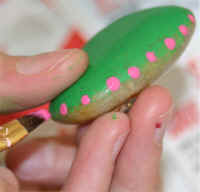 Optional: decorate further with glitter glue, sequins or crystals. 1 Samuel 17:47 And all this assembly shall know that the LORD saveth not with sword and spear: for the battle is the LORD's, and he will give you into our hands. Place both of the cut out templates before you, face up. Glue the template on the right onto the glue tab of the template on the left. You should now have one long piece of paper. Put glue on the glue tab (or tape) and glue it to the inside of the bag. Put glue on the tabs for the bags bottom and carefully press together. Add a bit of tape to make it extra sturdy (we're going to be storing rocks in here so want it to hold up.